Just got back from London last night! More on this later, when I’ve had time to recover from the jetlag and post photos, but it was a fantastic trip. However! I’ve come home to an inbox full of good news. First, The Hundred Thousand Kingdoms and The Broken Kingdoms have both been nominated for Romantic Times 2010 Reviewers’ Choice awards for best SF/F novels! I’m positively chuffed, as the folks across the pond would say. Also, this is Launch Week for The Broken Kingdoms! According to Amazon, it’s officially out in all English-language markets as of November 3 (Nov. 4 in the UK, go figure), but it’s actually been available in various places for the past few weeks, I figure we can be a little flexible with the dates. So let’s focus on another day. Like… today. Non-USians, you can play too! Send me a photo of yourself nagging your USian friends to go vote! Yell at a phone, waggle your finger using email emoticons, beg via Twitter — anything you feel comfortable sharing. Or, if it’s a voting day in your locale, do the photo-at-the-poll thing. Capisce? Off to go vote myself! ETA: Dun voted! See? See? I'm a CHAMPION because I voted. *I can only give you the English version of The Broken Kingdoms, note. I have two versions — US and UK — but the French, German, etc. editions of this book are not yet out. Sorry! ETA2: As folks have pointed out; I posted this late; some of you might’ve headed to the polls already by the time you saw it. 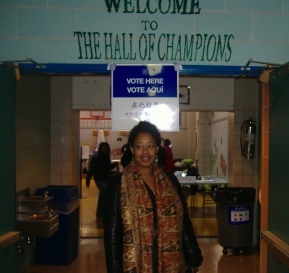 Therefore, USians are also able to participate by photographing themselves nagging others to vote! Yikes! I totally voted this morning but didn’t know you’d be doing this lovely giveaway. Oh, well.